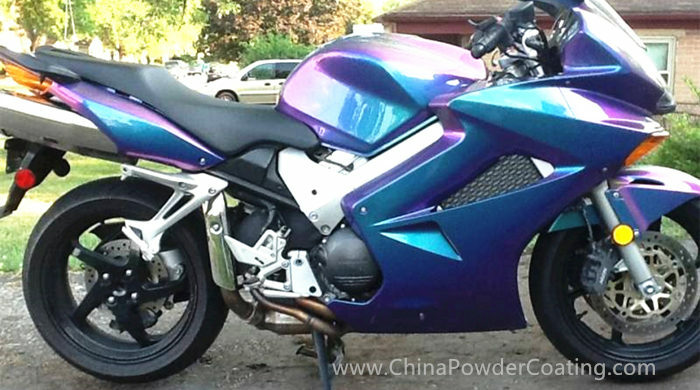 Chameleon paint is a kind of a special paint with other substances to produce color changes. General categories: temperature change and ultraviolet light discoloration of paint paint, different angles, natural light color changing paint (Chameleon). Temperature variation inside the paint containing heating may cause chemical reactions and colour-changing microcapsules, UV color-microcapsules containing color photographic encounters ultraviolet colors inspired the show colors. Chameleon paint is the core technology of new Nano car paint. Nano titanium dioxide pigment Aluminum powder mixed with Nano-titanium dioxide coated MICA Pearl pigment, added to the coating, the coating can produce optically mysterious and rich transformation effect. The mechanism is as follows: generally, characteristic of nanometer titanium dioxide nanoparticles surface effects, volume effects, UV-shielding and optically color effects, which are widely used in the paint additives. Has the rutile structure titanium dioxide has optically-color effect, looked at from a different angle, coated with a different color. Nano titanium dioxide can let visible light through, and of a degree of cover to visible light, led transmission light Aluminum powder and titanium dioxide surface creates a different perspective effects. When incident light into nanoscale titanium dioxide particles, due to the small size, strong scattering blue light occurs, strong reflecting green light and red light (yellow), with different point of view, different hues to the surface of paint film. Nano titanium dioxide adding metallic paint in, traditional popular surge of colored paint, and highly favored. Containing titanium metallic discoloration of finish coating of cars first by the United States Ford company in 1989 to create success. Chameleon paint metallic paint that is adjusted by adding special MICA powder form. Special forms of MICA (thin flakes) to the reflection of light that has a direction and so Chameleon paint coating will change with the angle of sight and showing different colors . Chameleon paint spraying process the same as the normal product, paint drying, adding appropriate colour powder varnish, mixing, spraying on the painted surface, forming plates in different color changing effect. Before the spray varnish, paint drying as much as possible, avoid the penetration of color powder, affecting color changing effect. Long color not color really change, but from a different perspective, body color, the core technology is the new car paint. How to reduce the construction cost of paint color is a new subject of research.